wildlife shorebird art sculpture 10 × 7 inches. 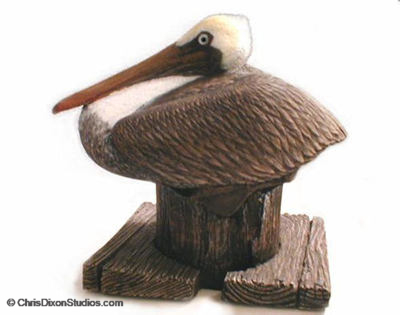 A favorite, the classic brown pelican shorebird sitting dockside on a piling. Also available as a white pelican waterbird. Let this friendly water bird roost at your waterfront home when you collect this fine artistic sculpture. Brown pelicans are the smallest members of the pelican family at 42 to 54 inches long, weighing 8 - 10 pounds, and with a 6 1/2- to 7 1/2-foot wingspan. In March and April two or three white eggs are laid (hatching approximately 30 days) with first flight in 75 days. Late winter adult pelicans sport the white head breeding plumage. Summer molts result in all pelicans having the all-brown feathers of juvenile birds. The brown pelican skydives ( from 60 - 70 feet ) after fish for food. Pelicans have changed little in the last 30 million years. After DDT was banned (1972) the Eastern brown pelican began to recover and by 1985 the bird was not endangered in the Atlantic, Florida and Alabama part of it's range. However, the brown pelican remains on the federal endangered species list in the Pacific Coast portion of its range, and in Central and South America. The prospects for these friendly 'fishermen of the sea' should continue to improve as long as there are shorelines for undisturbed shorebird breeding colonies and uncontaminated fish to dive after in the sea.